This morning at 6:51 AM, I received an e-mail from Netflix with the subject line: “Suspicious activity █████ Marvel on Netflix █████” Though I was curious as to what was going on, I left the e-mail unopened because just last week, Netflix was in the news for being linked to a phishing scam. A number of Netflix subscribers recently reported receiving odd e-mails from organizations claiming to be Netflix telling them that their accounts had been suspended. The only way to restore service, the e-mails said, was to click through to a link that would direct them to an external webpage where they would be able to put in their personal information like their credit card number, home address, and social security number. Though these e-mails were made to look as if they came directly from Netflix, they were in reality phishing attempts that, if you fell victim to them, could put you in the difficult position of dealing with a stolen identity. Because phishing scams don’t actually require any sort of direct involvement with the organizations they’re pretending to be, there was nothing Netflix could really do to stop the e-mails other than to remind subscribers to be on the lookout for questionable e-mails asking them for personal information. 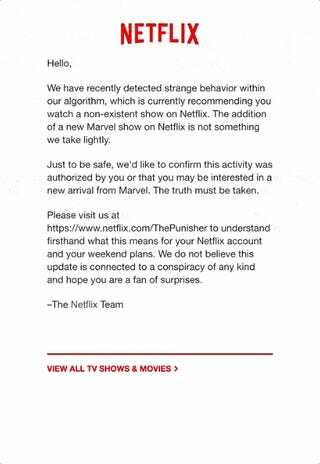 Imagine my surprise, then, when I heard of other people who’d received the same e-mail from Netflix, opened it, and discovered that it was in fact an official message... promoting The Punisher. When you open the e-mail, you’re presented with a GIF that initially looks like a proper message about Netflix having “detected strange behavior within [their] algorithm, which is currently recommending you watch a non-existent show on Netflix.” Before you can read the rest of the message, though, it begins glitching out and turning into the Punisher’s skull logo before finally becoming an actionable button that directs you to Netflix’s site. The gimmick here makes a certain kind of sense if you’re familiar with the Punisher’s lore or have been paying attention to the show’s marketing up until this point. 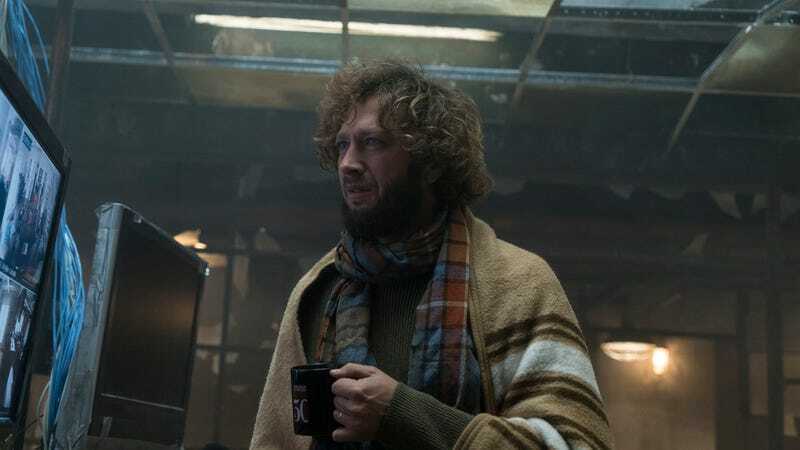 The Punisher works with an expert hacker who provides him with valuable information about the people he plans to kill as part of his war on evil and quest for revenge. It’s a dynamic plucked right out of the comics, but the optics of these advertisements are incredibly bad given how serious a problem actual phishing scams are. Then again, there’s nothing quite like thinking about being hacked by a known mass murderer’s sidekick to get you in the mood to watch some Netflix, right? We reached out to Netflix for comment and will update if we hear back. How do you justify a gun-toting hero like the Punisher in the age of mass shootings?